I’ve always had stories in my head. They were there just waiting to be pulled out when I needed to keep my three rowdy younger brothers quiet. There was a story for long trips in the car or bad weather days. If need be, I could read them something from my vast library of Nancy Drew and the Hardy Boys. Those books were the fuel that fed my love of mysteries that years later would lead me to Agatha Christie, Mary Stewart, and Phyllis Whitney. My teachers complained to my mother that I often daydreamed in class. I didn’t pay attention. When class got boring, I just flipped the switch in my head, and a wonderful story began to play. I tried my best to look attentive, which wasn’t easy. I struggled through school – then I struggled through life. After a failed marriage, my young daughter and I left the comfort of northeastern Ohio for Toronto, Ontario. It was love at first sight, and each year was more exciting and glamorous than the last. I became an active member of the American business community with ties to the American Consulate. It was a fantasy life, just like in the books that kept my mind occupied each day riding the subway trains. But just six years later, and at the height of my social life, my second husband was transferred back to Cleveland. I cried all the way to Buffalo. Then, before I had time to plan my next move, I had a devastating accident, which left me unable to walk without assistance for almost a year. I read over three hundred books that year. I expanded my interests into the genres of Romance and often read two Harlequins in a single day. I found myself rewriting some of the endings or continuing on with a sequel if the story ended too soon. One day, I told my mother that the stories in my head were often better than the ones I read. I guess I’d never explained to anyone about those stories that came out of nowhere. Her answer was that I should write them down. Gee, I’d never thought of that. And so in the summer of 1982, I began my first book – a paranormal set outside of London. I wrote it out longhand and then typed the completed pages on my portable typewriter. My world was perfect and I was going to become a writer. But not then. Fast-forward twenty-three years. I was sitting at my computer at work and suddenly there was a story in my head. It wouldn’t go away, and it wouldn’t let me think about anything else. So I started writing and finally finished at 160,000 words. But then the sequel was in my head, and I was in trouble because I didn’t know what to do next. I joined a writer’s group, and now I’m finally ready to tell my stories. I’ll be telling those stories from the rolling hills of northeastern Ohio. That is, when I’m not telling them from our home in the lower Florida Keys. 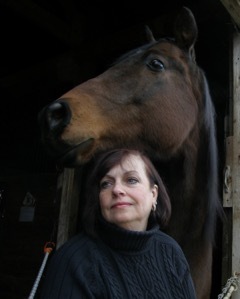 I’m also the Executive Director of CANTER Ohio (The Communication Alliance to Network Thoroughbred Ex-Racehorses). But that’s another story.